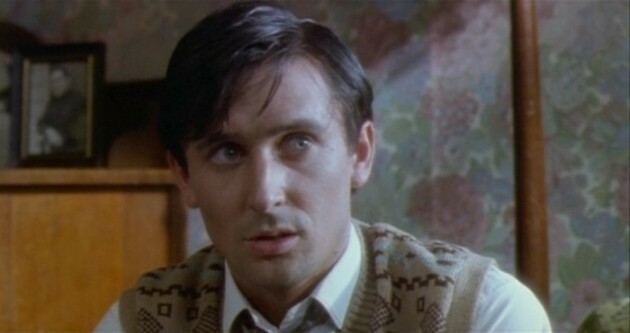 Mothers boy Lionel Cosgrove (Timothy Balme) lives at home under the ever watchful eye of his overbearing mother Vera (Elizabeth Moody). Vera hounds Lionel every minute of the day, getting him to do chores and constantly putting him down. Lionel longs for a better life. He gets an idea of what that might be like when he meets Paquita (Diana Penalver) who works at the local store. Lionel and Paquita fall in love and begin to spend as much time as possible together. Lionel and Paquita go to the zoo on a date. However not far behind is Vera, snooping and following the couple around a zoo. 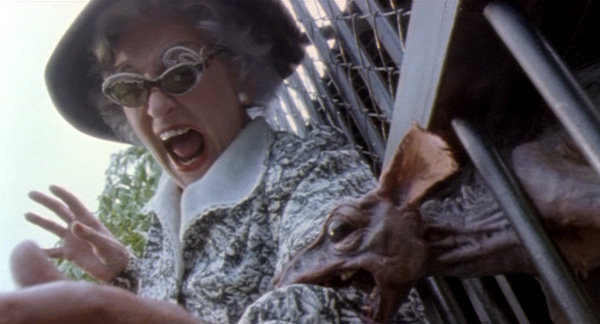 When Vera gets too close to one of the cages, a rat monkey reaches out and bites her arm. Later Vera begins to get very sick, with bits of her body falling off and her hunger seeking more than mere food. As Vera begins to bite and infect others, Lionely tries to keep a lid on the outbreak from his nosey neighbours and relatives. However when people come round for a party, things take a turn for the worse. The house becomes a bloodbath, with zombies breaking out left and right. Lionel is faced with the unenviable task of disposing of the infestation and saving the life of his beloved Paquita. This movie is a gorehound heaven. One of Peter Jackson’s (yes that one) earlier films, this needs to be seen. It’s a horror comedy that surpasses even Evil Dead II for gore and splatter. I laugh when I think of the people that sought out Peter Jackson’s back catalogue after watching Lord of the Rings, only to find this. This movie is not for the squeamish it must be said. It is packed to the gills with gore and some truly inventive kills. The cast seem to be having a whale of a time. The script is also brilliant, with some absolute zingers. You really need to check this out, I cannot stress that enough. 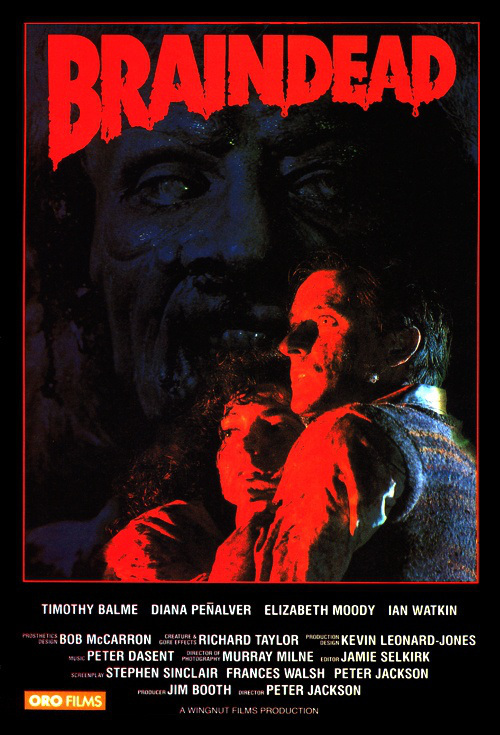 It is one of the best horror comedies out there, and for a film that’s 21yrs old that ain’t half bad. Argh, I need to hunt down this film. So keen to check out some of Jackson’s earlier, gorier work. Do buddy. It’s great fun. I’ve always found it sad that people went backwards from LOTR over Jackson’s catalogue and I’ve always felt lucky that I was introduced to Bad Taste when I was 14. Will you be reviewing Meet The Feebles? Oh I will indeed mate. I love Meet the Feebles. I know what you mean though buddy. 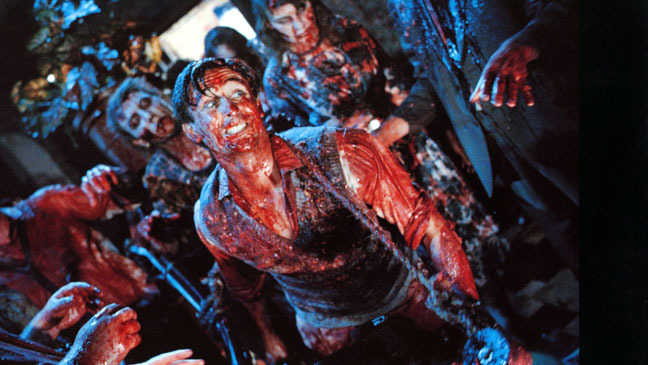 My first taste of Peter Jackson’s genius was Braindead and I’ve never looked back. I’m gonna review The Frighteners too as I just adore that movie. He has a cameo in Hot Fuzz??? Never knew that lol. He’s the Santa who stabs Sgt Angel through the hand.